Lower Saucon Township Police Chief Tom Barndt discusses the technological advantages of the Crimewatch program with township council Wednesdsay. 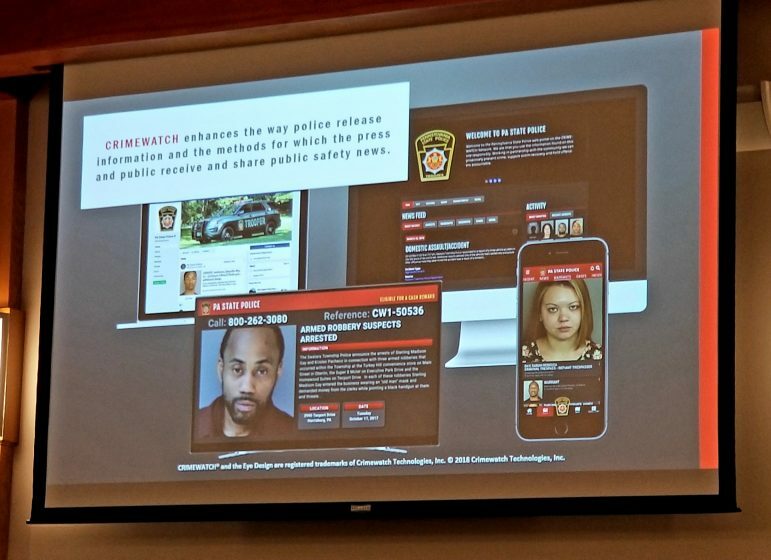 A slide in a presentation about the Crimewatch online program for police departments shows how information and public safety news is disseminated across an array of devices. 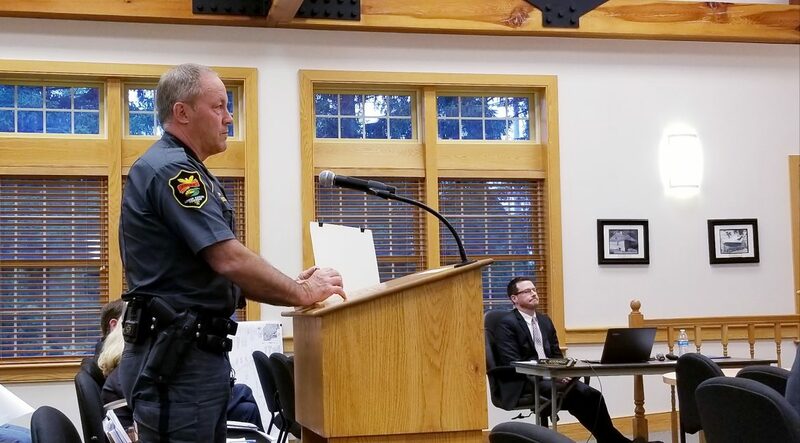 Lower Saucon Township Council was receptive to a presentation Wednesday about a technology application called Crimewatch that could be an asset to the township’s police department in its fight against crime. The Crimewatch website was developed specifically for law enforcement, which is why it’s effective, company representative Douglas Demangone told council, who also noted that the company is an official partner of the Pennsylvania Chiefs of Police Association and works with state police. Police can quickly and easily post updates about everything from missing persons to wanted individuals on their department page at CrimewatchPA.com. Those updates–following supervisor approval–are then simultaneously broadcast to media partners, social media followers, email subscribers and local officials. Another advantage, he said, is that by circumventing the need to create individual Facebook posts as an investigation progresses, township police will have more control of their message in cases involving missing persons who are subsequently found, for example. Typically a post about a person who has gone missing is shared on Facebook thousands of times, while the post about them being found safe is shared far less often. With Crimewatch, Demangone said, the original post will be updated for a more seamless and less confusing result. Since its launch in 2011, the Crimewatch network has grown exponentially to reach millions of citizens nationwide and generated approximately 5,500 tips that have led to hundreds of cases being solved, he told council. In some cases, individuals wanted by a police department will opt to voluntarily turn themselves in once their photo and a physical description are published, a TV news story by NBC10 Philadelphia indicated. In the 2017 story about the Bensalem Police Department’s use of Crimewatch, an official with the department told the news station that in the first 10 days post-launch, Crimewatch led to six arrests. The use of Crimewatch among Bucks County police departments has grown to the point where there is now a county-wide network of departments using it, which Demangone said ultimately benefits all the departments as well as the public from a communication and crime-fighting standpoint. The Springfield Township Police Department in Bucks County is one of the departments now using Crimewatch. Part of Springfield Township borders Lower Saucon Township. In Upper Bucks County, the Quakertown borough, Richland Township, Perkasie borough, Tinicum Township and Dubin borough police departments all have recently-developed Crimewatch sites. Lower Saucon Township Police Chief Tom Barndt praised the program, which he said will be a big “timesaver” for the department if it is deployed. Rather than separately writing news releases, Facebook posts and news alerts, the communication of information will become streamlined, he said. “It’s more professional in the manner that it’s composed,” he added. Barndt said that following a demonstration from Demangone, he polled his officers and found overwhelming support for using Crimewatch. “This is a win-win for us,” he told council, adding that he plans to discuss the program with the association of Northampton County police chiefs. “I’m glad to hear that,” councilwoman Priscilla deLeon told Barndt. Demangone said the yearly cost of the program is $2,046.60, which could come down if more departments in the county opt to join the network. Although Hellertown Police Chief Robert Shupp was unable to attend the presentation Wednesday, Barndt noted that Mayor David Heintzelman–who oversees the borough police department–was attending in his place. Council did not vote on approving the purchase of Crimewatch at its meeting, but after township manager Leslie Huhn said she also thinks it will be beneficial to township police she was directed by council to work with Barndt over the next two weeks on a plan for purchasing it. Demangone said the township’s Crimewatch page could be live by mid-July. DeLeon noted that in the future, the township may be able to apply for grants to help pay for Crimewatch, since it is a public safety application. With about 140 police departments statewide now participating in Crimewatch, “hopefully it’ll be a domino effect,” Barndt commented.